I puzzled for days as I watched the news out of Britain. Heathrow Airport, a major international hub, is still screwed up, days after five inches – just five inches! of snow fell on London. 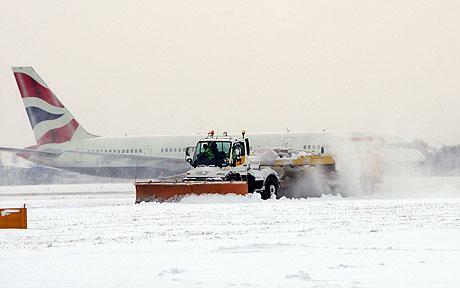 Snowy chaos at Heathrow Airport recently. In many other airports, like Minneapolis and Montreal, such a storm would practically pass unnoticed. Granted, London isn’t as used to harsh winter weather as, say, Duluth. But still, the Heathrow chaos must mean somebody screwed up big time. And the answer, according to the Daily Beast, might be…. shopping! A private company runs the airport. Anybody who’s been in airports knows that the stores and shopping malls are wayyyyy overpriced. So somebody is making a ton of money off those stores. According to the Daily Beast article, the company invested lots of resources into expensive stores, because that makes the company money. But they didn’t buy enough plows and de-icers, because of course that doesn’t make them any money. Instead, it’s an expense. So, people are stranded at Heathrow for days and days, but hey, why are they complaining? They can spend that time buying $200 handbags and $12 cocktails. These stranded people should be happy they are contributing to the company’s profits. It’s so petty of them to be complaining about missing family holiday celebrations, weddings and funerals. Nothing against capitalism, but whoever runs an airport, especially a crucial international hub, ought to figure out how to make the planes actually fly. Shouldn’t that be the cost of doing business? But I guess it’s more important to sell $20 sandwiches that taste like cardboard. This entry was posted on December 22, 2010 at 3:59 pm and is filed under Uncategorized. You can follow any responses to this entry through the RSS 2.0 feed. You can leave a response, or trackback from your own site.